For the environmental extremists attending the U.N. climate change summit in Copenhagen, fighting global warming is not just about reducing carbon emissions or promoting alternative energy. Rather, public documents released by some of the most important organizations represented at Copenhagen reveal an absolute obsession with population control and a bizarre belief by environmental extremists that population reduction is the “cheapest” way to achieve a reduction in carbon emissions. You see, to many of those gathered in Copenhagen, the math is simple. Less people = less carbon emitters. In fact, a carbon offset initiative launched by the Optimum Population Trust even allows people to offset their “carbon footprint” by making online payments to support “family planning” in poor countries. In other words, you can now be forgiven for your carbon “sins” by paying for a baby on the other side of the world to be killed. As bizarre as this may seem, it is actually happening. These new “population carbon offsets” are being offered by the Optimum Population Trust. The OPT calls itself “the leading think tank in the UK concerned with the impact of population growth on the environment”. The truth is that the OPT does have some really big names associated with it. Just some of the world famous individuals involved in the Optimum Population Trust include Sir David Attenborough, Stanford Professor Paul Ehrlich and Dr. Jane Goodall. One of the stated goals of the OPT is to “advance the education of the public in issues relating to human population worldwide and its impact on environmental sustainability”. I’m going to try not to have more than two children! To show just how committed they are to the population control agenda, the OPT launched this population carbon offset scheme on December 3rd – just prior to the beginning of the Copenhagen climate change summit. In his report on this new carbon offset initiative, John Vidal, the environment editor for the Guardian, noted that many of the participants at the Copenhagen summit could easily offset the carbon emissions that they would be producing during their travel to the conference by paying for one child in Africa to be killed…. Calculations based on the trust’s figures show the 10 tonnes emitted by a return flight from London to Sydney would be offset by enabling the avoidance of one unwanted birth in a country such as Kenya. In fact, the OPT has launched a dedicated website, http://www.popoffsets.com/, which allows people to offset their carbon footprint by making online payments to OPT which will go towards “family planning” around the world. But not only that, earlier this year the Optimum Population Trust commissioned the London School of Economics to produce a report on population issues. The final report, entitled “Fewer Emitters, Lower Emissions, Less Cost“, says that the best way to reduce “greenhouse gases” is to have fewer people on earth. This report by the London School of Economics actually performed a “cost-benefit analysis” on the various methods for reducing carbon emissions around the world, and they found that the “cheapest” way to reduce carbon emissions by far was to increase funding for “family planning”. But not only is population control the official agenda for organizations such as the OPT, it is also the official agenda of the United Nations. Very few people have talked about the U.N. Population Division policy brief from March 2009, but it is an absolutely explosive document. This shocking policy document openly asks how fertility decline in the least developed countries can be “accelerated” as quickly as possible. The entire March 2009 U.N. Population Division policy brief can be read here…. The policy brief begins with this shocking question…. The report then proceeds to discuss how the earth’s population is clearly unsustainable (especially in “developing” countries) and it considers what can be done to make sure that fewer babies are born in the “least developed” nations. But as bad as that report was, the U.N. recently released a report on population that was even more shocking. The director of the UNFPA says that we are on the brink of disaster. And what is causing it? According to him, the biggest cause is population growth. But the truth is that mankind is not even causing climate change. For those who do not yet understand this, we highly recommend that you read a comprehensive article that we posted about this issue on our sister site entitled “How To Save The Environment? Get Al Gore The Heck Away From It”. But even if you concede that humanity is causing climate change, the truth is that there is still no justification for reducing the population in order to combat it. But according to the authors of this new U.N. report, the link between population growth and climate change is undeniable…. In fact, the authors of the U.N. report are convinced that population growth has been responsible for approximately half of the growth of worldwide carbon emissions…. According to the authors of the report, humanity must be “mobilized” to fight the causes of climate change before disaster strikes…. So what is the very best way to reduce carbon emissions according to the U.N. report? Well, according to the report, each birth that can be eliminated can have a dramatic impact on reducing carbon emissions….. But the authors of the U.N. report also recognize that the idea of “population control” is extremely unpopular in many areas of the world. But that is not stopping them from suggesting that it is time to seriously address population control as part of the battle against climate change…. So if “climate change” is the world’s biggest problem, who is the enemy? Well, it turns out that humanity itself is the enemy. The U.N. report is very clear that no human can ever be “carbon neutral”…. So if no human can ever be “carbon neutral”, what does that mean? It means that you, me, our families and everyone else on earth is a part of the problem. The fact that we exist is a problem to them. So what is the solution according to the authors of the report?…. In other words, we all need to pass out more condoms, encourage more women to get abortions and tell more women that they need to focus on their careers instead of their families so that we can get them to have less children. You see, the term “family planning” in the report is just code for things like “lower fertility rates” and “smaller families”…. The reality is that the U.N. report uses a lot of thinly veiled, politically correct language to suggest that in order to fight climate change, radical population control measures should be implemented. Thanks to the Obama administration, the UNPF will have plenty of money with which to pursue that agenda. Back in March, the Obama administration reversed the Bush administration’s policy and directed that 50 million dollars be given to the United Nations Population Fund. So not only is the United Nations Population Fund promoting their population control agenda around the globe, they are also using American tax dollars to do it. 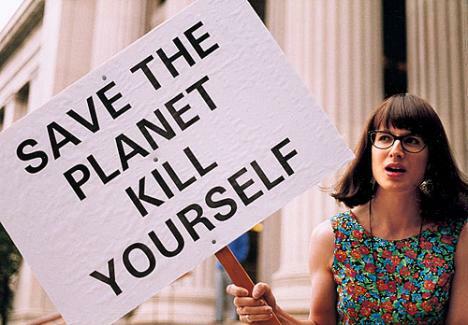 But it is not just the environmental elitists among globalist organizations that are obsessed with population control. The truth is that the population control agenda is taught side by side with the global warming and radical environmental agendas in universities throughout the world. Millions of normal people who have been indoctrinated in these universities are now buying into this agenda and are taking action. For example, there is actually a website entitled “One Less Child” that openly promotes the idea that people should have one less child. The idea is that having less children is the absolute best thing that a person can do to help the environment. Their mission statement actually says the following about the need to control the population…..
To have couples consider population reduction through less offspring. Having less offspring actually increases the quality of life of your current offspring, which is what every couple wants. Not only that, but an author by the name of Diane Francis recently authored an article in a national Canadian newspaper that openly called for Canada to implement a formal one child policy like China has done. Her article, entitled “The Real Inconvenient Truth”, has fortunately caused an uproar throughout Canada. It seems that most Canadians are not yet ready to accept a mandatory one child policy. In her article, Francis presents two scenarios. The first is if a one-child policy is implemented worldwide. The second is if a one-child policy is not implemented…. These radical environmentalists actually believe that there will be unprecedented global disasters if radical population control measures are not enforced across the globe immediately. Of course by now most people who will read this article know that this bizarre population control agenda is even represented in the White House. Barack Obama’s “science czar”, John P. Holdren, once co-authored a textbook entitled “Ecoscience” in which he advocated population control measures that are so wild and so bizarre that it is difficult to believe that a sane individual actually authored them. What follows are actual quotes from Holdren’s textbook…. Keep in mind that Holdren is now Barack Obama’s top science advisor. But even some of the richest people in the world are absolutely obsessed with population control. Back on May 5th, Bill Gates, David Rockefeller, Warren Buffett, George Soros, Michael Bloomberg, Ted Turner, Oprah Winfrey and a number of other of the wealthiest people in the world gathered for a clandestine meeting in Manhattan. The meeting was supposed to be so secret that many of the billionaires’ aides were only told that they were at “security briefings”. So what was so important that so many of the wealthiest people in the world had to gather for a secret meeting? This is what the richest people in the world are so upset about? The article goes on to quote one attendee of the meeting as saying the following about the “overpopulation problem”…. Apparently they do not intend to include the rest of us as they come up with their “big-brain answers”. It would be a mistake to underestimate how obsessed the global elite are with population issues. The truth is that they are absolutely committed to trying to solve the “population problem” in this generation. So what will their “solutions” look like? But what we do know is that in the name of fighting “climate change”, the United Nations and the global elite plan to pursue a radical population control agenda. According to their own documents, the number one problem the world is facing is “climate change” and the number one cause of “climate change” is overpopulation. Knowing that many nations on earth will never willingly submit to open population control measures, the global elite will likely implement their population reduction methods by subtle means. Let us just hope that they are not successful in their attempts to eliminate as many people as possible. February 3, 2017 in COVER-UP, EUGENICS: Population Control & Bio-Specific Engineered Diseases. 99% PROOF: Did The United Nations Just Call For The Decriminalization Of All Drugs? Despite rises in Carbon dioxide (CO2) levels, there’s been no global warming for about 19 years. http://www.wattsupwiththat.com & put in search box: no warming 18 years 9 months. This why the hoax was renamed ‘climate change’ from the original ‘global warming’ scare label. The climate has been changing for about 4.5 billion years, the entire age of the earth, as Buzz Aldrin said. The climate will always change as the sun’s output of heat varies on different cycles: 11, 22, 88, 200, 1500 & 1.4 million year cycles. Other climate influences are: volcanoes, 85% of which are undersea, a 40,000 mile chain; clouds; the earths variable orbit, magnetic field & tilt; supernovae; & the solar system’s passage through the 4 arms of our milky way galaxy. The UN climate models ignore all these factors. They can’t do the earth as a globe: that’s too complicated. The earth is represented as a flat disc: a pure joke. Of the greenhouse effect, water as clouds or invisible as vapour is about 96%. CO2 is less than 4%. Of the CO2 about 96% is produced by nature: rotting vegetation; volcanoes; outgassing from oceans etc, less than 4% is human or industry produced. Human CO2 drives climate? Do me a favour! Great books: Heaven and Earth global warming: the missing science, by prof. Ian Plimer. The warming/climate scam agenda has always been: vast depopulation, up to 95% wanted by some: 13 out of 14 people to “go”; de-industrialisation back to feudal times, with no middle class, just Lords & serfs; and a one world totalitarian govt, all nations having been destroyed. Many goods graphs & articles also. Book: Merchants of Despair, by nuclear PhD engineer with 9 patents to his name or pending, Robert Zubrin. Details the Genocidal past of the Malthusian monster Darwinian 1%s pushing this deadly agenda: forced famines in Ireland & India etc. Also shows how the Left has been seduced into this agenda, & how safe & clean nuclear power is being suppressed. Saving the best till last: more people has always led to more prosperity. Middle & working class people now live better & longer lives than medieval Kings. A larger population allows people to specialise: woodworkers, metal smiths, doctors, nurses, farmers, inventors & entrepreneurs, etc. Also Banksters & politicians, unfortunately. Book: The Ultimate Resource 2 by economist Julian Simon. Human ingenuity is the ultimate resource. Why is this happening? Because our money system is based on fiat currency created out of thin air, as debt. More debt has to be created to pay the interest on original debt till we wind up where we are: the world is choking to death on debt. This is what is not sustainable. Book: Pawns in the Game, by William Guy Carr. Go on youtube & put in Retired Head of FBI Tells All. Ted L. Gunderson was an honest man who uncovered much pizzagate style satanic child abuse among the elite & their cronies. The foundation of the US Fed by the international Banksters & confirmation that the global warming/climate change deception is a fraud.